The 2002 World Cup hosted jointly by South Korea and Japan was already infamous for its horrendous refereeing, most notably two knockout stage match-ups involving South Korea. Today, one Italian paper has linked what was widely believed to be match-fixing behavior back then to this current FIFA scandal. The Corriere dello Sport newspaper alleges that the referee who presided over Spain’s defeat to South Korea was designated by Jack Warner. The newspaper claims the under-fire former FIFA executive assigned referees to a number of matches at the tournament, among them Spain’s controversial penalty loss to the joint-host nation. Egyptian referee Gamal Al-Ghandour was instructed to oversee the quarter-final tie, with Warner’s fellow Trinidadian Michael Ragoonath chosen as his assistant. Jack Warner, if you don’t recall, is the corrupt former FIFA bigwig at the center of the American FBI informant Chuck Blazer’s corruption allegations, which in large part set this current scandal in motion. Warner was ousted from FIFA a few years ago for getting his hand caught in the cookie jar, and was arrested in relation to this FBI investigation earlier this week. 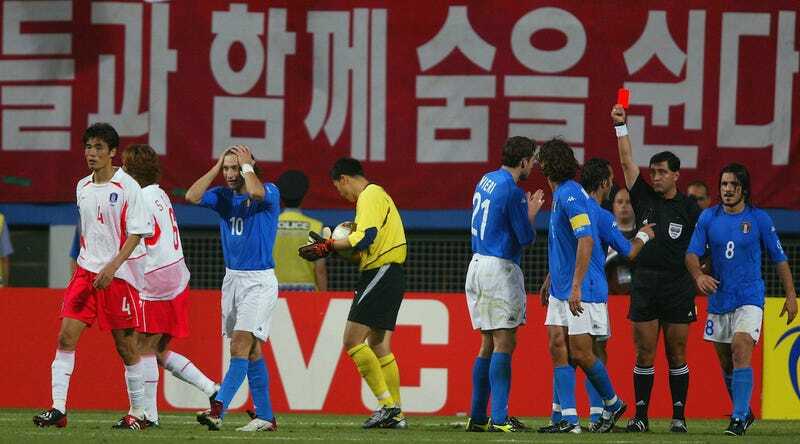 While it is not suggested that Warner selected the referee for Italy’s 2-1 extra-time defeat to South Korea in 2002, the Italian press have long viewed that game with scepticism. Ecuadorian referee Byron Moreno, who sent off Francesco Totti during the game, was recently released from a 26-month sentence for drug trafficking in New York. So, one referee explicitly assigned to ref a match by a man known to be on the take goes on to make multiple, nigh-unbelievably bad calls that helped a far inferior team progress through the tournament, and another ref making similarly terrible calls in favor of the same team ends up in the drug trade. Four more years! Four more years!